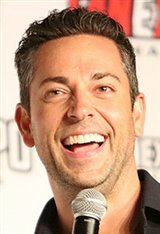 Born in Lake Charles, Louisiana, Zachary Levi grew up all over the country before his family put down roots in Ventura County, California. At the early age of six, Zachary began acting, singing and dancing in school and local theater productions. Levi began acting onstage in community and regional theater when he was just a kid, but it was a very grown-up performance in 1991 as Hank in the play Marvin's Room that booked him an agent. His first big break onscreen was a supporting role in the FX TV movie Big Shot: Confessions of a Campus Bookie (2002). Among other TV work, he played Kipp Steadman on the sitcom Less Than Perfect (2002-2005) with Eric Roberts. Levi got his big break when he scored the lead role of geeky unlikely hero Chuck Bartowski on the spy comedy TV series Chuck , which aired from 2007 to 2012. In 2008, he was ranked #22 on Entertainment Weekly's "30 Under 30" actors list. Zachary is also well-known for his voice work, having played Toby in Alvin and the Chipmunks: The Squeakquel (2009) and Flynn Rider in the Disney hit, Tangled (2010). He also provided the voice of Joseph in the animated film, The Star (2017). Most recently, he played the lead role in the superhero adventure/comedy Shazam! (2019). In his spare time, Zachary, who is divorced from actress Missy Peregrym, lives in Los Angeles. He enjoys playing poker, skateboarding, snowboarding, tennis and skydiving. Fan Expo: Day One Roundup with Matt Smith and Zachary Levi!